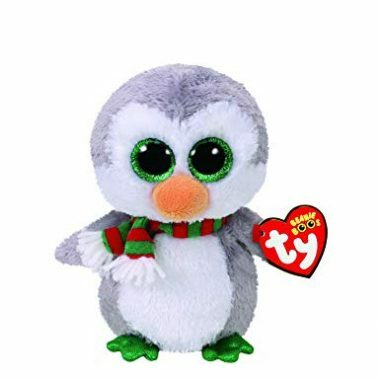 Chilly is a grey penguin with large, glittery green button eyes and an orange beak. He has a white face and belly and wears a green and red striped scarf with white yarn tassels. His feet are shiny and green. And when I play out in the snow, I’m always acting silly. Chilly was released in October 2017. His Birthday is on 18th March. Chilly is a Claire’s exclusive Beanie Boo. There are four versions of Chilly. This medium 9″ Beanie Boo Buddy, a small 6″″ Beanie Boo, a large 12″ version and a key clip.